Linpack is a benchmark and the most aggressive stress testing software available today. Best used to test stability of overclocked PCs. Linpack tends to crash unstable PCs in a shorter period of time compared to other stress testing applications. Linpack Xtreme is a console front-end with the latest build of Linpack (Intel Math Kernel Library Benchmarks 2018.3.011). This project was created because Prime95 is no longer effective for stress testing like it used to be. LinX, IntelBurnTest, OCCT use outdated Linpack binaries from 2012. Make sure to keep an eye on the temperatures as Linpack generates excessive amount of stress like never seen before. Added /residualcheck command-line switch. 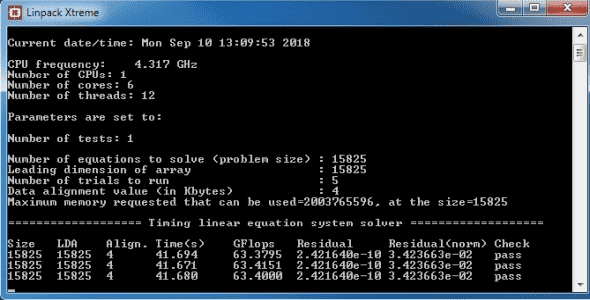 This improves error detection on legacy Intel CPUs. It is enabled by default on AMD CPUs. Added stress test profiles of 14GB and 30GB. Added quick and extended benchmark profiles. Fixed false positive hardware errors. Changed benchmark preset to run just once but for a longer period. Disabled HT/SMT on the benchmark mode. Updated CPUID HWMonitor to version 1.37.